Firstly I would like to thank Al_Fe for coding the simple yet effective combat system for me. It's been a gruelling 4 months but this finally pulled through. 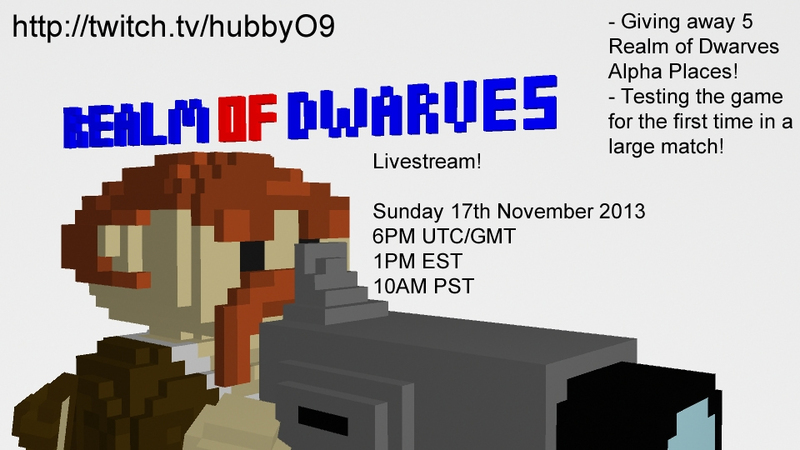 I will be streaming on the 17th November 2013 at 6PM GMT here, I will be playing a medium-ish but the largest yet game of Realm of Dwarves. This will include the alpha testers. I will also be giving away 5 alpha testing places, however you must be signed up here first here! Also, thank you for all the application forms, we will be going through them shortly. I will not be releasing a change log seeing as it is a bit of an initial release. Please note that the game is not up for download, however the public beta or alpha may be released in a couple of months time. This all depends on how much time I have for this. That is all for now and I will keep you posted on the latest information!